Rather like many cars these days the new SEAT Ateca is a crossbreed. The assembly may be in one plant but the components arrive from all over the world. It is European. And in case you are wondering Ateca means Athletic in this case a fine sprinter but with long distance attributes. 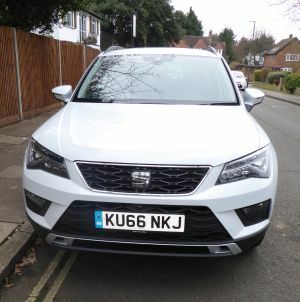 Ateca SE 1.4 EcoTSI 150 PS. SEAT was established in 1950 in Barcelona and after a relationship with FIAT effectively became part of the Volkswagen Group in 1982. 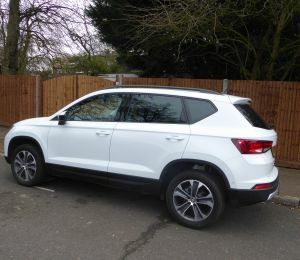 Whilst it retains its own design, styling and engineering bureau, based in Spain’s second city, the Ateca is produced at Škoda's production facility in Kvasiny (Czech Republic), alongside the next-generation Škoda Yeti. German quality and Spanish finesse produced by mid-Europeans. SUVs are all the rage. They are also called “Crossovers”. If you have forgotten what the acronym stands for it is Sports Utility Vehicle, which in practice means an urban car that sits high up above the road and has large (in this case 17”) wheels with plenty of ground clearance, ideal for the land of pot holes that Britain is increasingly becoming. It does not mean four-wheel drive, but if you have a need for off-the-road driving an Ateca version is available including additional snow and countryside profiles, plus a Hill Descent Control function. Climbing up to the car (it is the same with all SUVs) the first thing apparent is the neat layout, quality finish and in the road test example, an 8” touchscreen. It does not have a head-up display on the window screen, thought ideal for safety purposes by this writer up to now. Once you have set your destination, very easy, your directions come up on the satnav as well as on a screen between the rev counter and speedometer. And junction instructions as you arrive at the next intersection. It is all part of the Navigation System, an extra (£525) including DAB radio on this model. It’s a clever and not expensive innovation that one suspects others will copy. In total the options came to just under £5,000 including an array of four cameras, located in the front grille, rear bumper and both door mirrors. These can combine to provide a bird’s eye 360-degree view of the vehicle’s position on the screen, making tight parking spaces easier to negotiate. Four different image modes can be chosen, including a front or all four wheels with guidelines to show the steering path to take to avoid hitting the kerb or roadside obstacles – invaluable in helping keep the alloy wheels pristine (pre-ordered at £640). Also included was Park Assist (£325) with front and rear sensors, what was termed Advance Driving Assistance Pack (£790), and LED lighting (£820). If you have a budget just be a bit picky on what you go for with extras, but ensure that you get the navigation system. At £20,000 for the basic car it competes very well with the Hyundai Tucson, Kia Sportage, Renault Kadjar and Peugeot 3008. 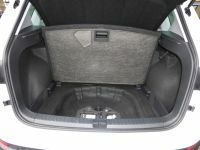 Also in the same bracket is the Nissan Qashqai and here the SEAT really scores, the cavernous rear load area of 510 litres vastly superior even before you move the rear seats which then give a maximum space of 1600 litres. That is vast. With a 0-60 mph time of 8.5 secs the Ateca is quick. For a tall car there is little body roll and you can speed through a fast corner. Thanks to the high-set seats, you get a great view of the road from the Ateca. The S of SUV is fully deserved, even when five up and 45mpg on petrol should be obtained if you drive fairly carefully. Now gaining in popularity is the under rear floor optional double floor system to help organise storage of muddy boots and the like. But it is an extra (£115). 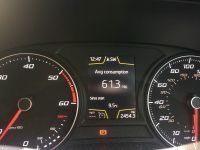 Adaptive Cruise Control makes for easy motorway cruising. It is not for everyone but once you get used to the idea that the car will slow when approaching the vehicle ahead alertness is still needed, but with less strain. Your road tester is not an enthusiast for six-speed manual gearboxes. Just too much declutching for him. He is an automatic fan. However in defence of the test Ateca the flexibility of the engine allows one to stay in top gear for much of the time, and even getting away in 2nd very easy. The SEAT came with ‘stop – start’ system popular with some and easy to switch off. But remember to deal with again when next starting out. The system reverts to the factory settings when you switch off. The button is easy to spot but it does need pressing if the fad is not for you. Shooting brakes, or what was once called, estate cars, were once all the vogue. Now it is SUVs, ideal for the school run but also fine for the long weekend trip. The SEAT Ateca is a new addition to an increasingly competitive market. It is up with the best of them.